With nearly 120 breweries in the state of Minnesota, the craft brewing scene is very much alive and vibrant in the 32nd state. Minnesota is home to August Schell Brewing Company – the second oldest family-owned brewery in the country. Summit Brewing in St. Paul just turned 30 years old this year, and then there’s the little ol’ Surly Brewing Co. – an actual destination brewery based here in Minnesota, too. There is plenty to be boastful and proud of, yet even those three powerhouses barely begin to scratch the surface of what Minnesota means for craft beer. You, the perfect craft beer connoisseurs and avid fans, are the ones checking new breweries off your bucket list, revisiting your favorites, and proudly supporting the entire craft community in this great state of beer. At Bernick’s, we’re passionate about connecting those breweries with the consumers who will become raving fans, and diehard loyalists to the brand. We value service and innovation, and we continue to learn and admire from the brewers, taproom pros, and craft enthusiasts in Minnesota. With that, we wanted to highlight not only the craft beer scene, but also the people who have breathed life and passion into this industry. That includes everyone behind the brand’s label, but it also includes you. Your favorite breweries and brands deserve recognition and a platform to garner praise, appreciate support, and foster those craft beer-loving feelings. Think of the next time you plan to partake in Minnesota craft beer – picking up growlers for Sunday’s game, meeting the girls at yoga at the taproom next weekend, or joining your co-workers for a celebratory toast at your favorite brewery. When the opportunity arises, share it with us. Include the hashtag #MNFlagshipBrews and make the push to highlight your brewery (or breweries; we know it’s hard to choose just one!) and connect Bernick’s to the scene and beer you love best. 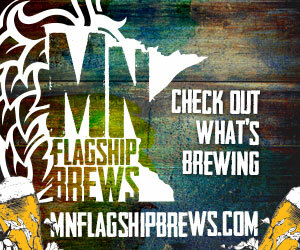 In turn, we’ll create a custom, limited edition #MNFlagshipBrews poster and send you a copy. Won’t it be cool to see your favorites included in the artwork? Drinking good beer is easy in Minnesota. So is highlighting your #MNFlagshipBrews.